Don’t you just love her? She is exactly like the Patty Playpal I got for Christmas in 1959. Unfortunately during a move she was lost. My wonderful husband replaced her for me in 2004 when Ashton Drake reproduced them. 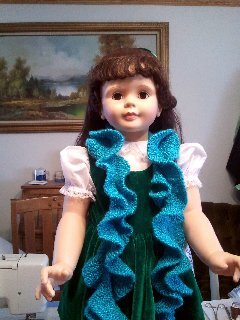 Patty is modeling the Potato Chip Scarf I just finished.